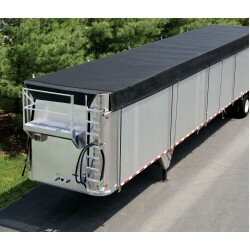 Generally, there are 2 styles of Side-To-Side roll tarps, Strap Type or Kwik-Lock (rolls up under the latch plate for lock down). 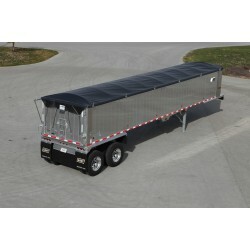 This tarp is commonly a solid vinyl tarp to keep load dry or a mesh tarp used for sand, gravel etc. or product that does not need to be dry, with a 2” roll pipe pocket on one side and a smaller secure pipe pocket on the other side (sometimes they have an attached front or rear flap attached. ).